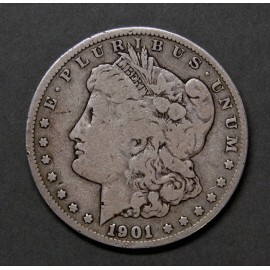 1 USA silver dollar of 1901, "O" New Orleans, 900 pure silver, 26.73 gr. - 38.1 mm. in diameter. 1 USA silver dollar of 1901, "O" New Orleans, 900 pure silver, 26.73 gr. - 38.1 mm. in diameter, good patina, good condition.